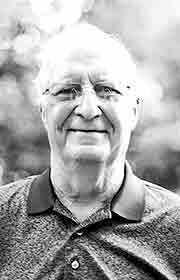 CAMDENTON, MO — Lyle Taiber, 75, of Camden­ton, MO, formerly of Moorland, passed away from cancer on June 12, 2018 in Des Moines, at Kavanagh House. Lyle was born on February 8, 1943 in Lake City, to John Jr. and Margaret (Mackey) Taiber. Lyle worked for UPS for 35 years. After retiring at the age of 57, he enjoyed traveling the world and spending time at their home at the Lake of the Ozarks. Lyle is survived by his wife of 54 years, Jane (Miller) Taiber; his sons, Terry (Roxanne) Taiber and Dan (Stacy) Taiber, both of Urbandale; granddaughters Miranda (Jace) Lee, Madison Taiber, Ava Taiber and Mya Taiber; and sister Rosemary (Mike) Kane of Cedar Rapids.